National Bank is the sixth largest bank in Canada, and leading bank in Quebec, headquartered in Montreal. The financial institution revealed during its Q2 2016 earnings call it will soon support Apple Pay for its customers, as revealed by senior vice president of finance, Jean Dagenais. Analyst Peter Routledge from National Bank Financial posed the question of Apple Pay and how it will tie into the company’s mobile payment strategy, giving now that the ‘Big 5’ are all on board. Clearly we will follow suit and join Apple Pay the timeline is to be discussed with my colleagues here but I think we echo some of the comments from our competitors that is customer driven market and that’s where the customer wants, that’s what they will get. In terms of I think we are – we expect that the – in terms of cost and everything else, in terms of sharing I think it should be similar between the different market players. That being said though Rob as you know, given the fact that National Bank has a large corporate and commercial banking business, large in fact on a comparative basis to our peers any impact on payment is going to impact us less because retail payment is a smaller proportion of our revenue and has been historically really from the last 10 to 20 years is smaller percentage of our revenues than our peers. So, we’re watching that very carefully, we will follow suit very soon but on a relative basis we feel we less impacted than they are. And that’s why frankly we were not at the forefront of those negotiations, we were somewhat hiding at the back and waiting for these guys to settle on the negotiations. In other words, National Bank says the delay for announcing Apple Pay was due to the fact they were waiting to see what their competitors were able to negotiate with Apple. Also, the bank’s core services are corporate, rather than personal banking, compared to its banking peers, hence the lack of urgency to make an announcement. La Presse reports National Bank created a new role of Chief Transformation Officer, headed by Ricardo Pascoe, to help the bank quickly adapt to the technological changes of mobile payments, headed by a team of 5-10 people. Last month, National Bank said they were “evaluating” various mobile payment solutions, with Apple Pay being one of them. But now we know for sure Apple Pay is coming, it’s just a matter of when. Another giant Quebec financial institution, Desjardins, has remained mum on Apple Pay, similar to PC Financial. 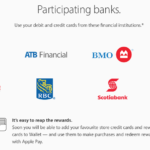 With TD, BMO, Scotiabank, RBC and CIBC all supporting Apple Pay now, the ball is in the court of ‘smaller’ financial institutions to jump on board. Tangerine has said its Apple Pay launch will come by the end of July.